As much as I wish it could be August 32, the reality is summer is over. There is a silver-lining though, and it goes by the name of fall shopping! Here are the key season pieces I am lusting after in no particular order: a gorgeous go-with-everything sweater that I can wear any day of the week without shame like this Isabel Marant or this J.O.A. Sweater weather also calls for a perfectly on-trend body-hugging ribbed turtleneck to layer under everything and a long tunic-like sweater to wear with pants and knee-length skirts. I love all these iterations by Topshop, AYR, Alexander Wang, Vince, Asos, H&M, and Zara. Also needed: at least one boho romantic dress, perhaps an Asos, or a Derek Lam and or a Gucci. 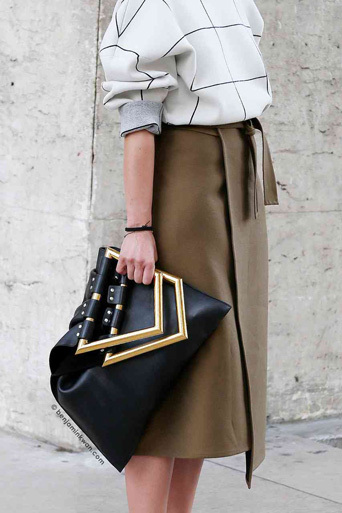 A polished wrap skirt, similar to above, is also a must. Take this one or this one. Outerwear is outfit-making this season, so I don't mind spending a little more, especially if it looks like this, this or this. (P.S. I wouldn't mind having a less expensive back-up or two--Joe Fresh and Mango--to keep me warm.) Shoe-wise, I'll need backless Gucci loafers (or these or these) to look up to date, along with these kind of boots (or this pair or this pair). I'm sure I'll be adding to this list as the cold weather starts to blow in--and you can be sure I will share my updates! Where is that purse from?. .. I love it! Always love all of your picks, you have the best eye!